Submit news and files here. With the launch of ShogoMAD.com and the addition of an in-house files system, TNL is now officially closed, and has been added to the ShogoMAD Archive! All the links within the website will continue to work, but file sections and news here will no longer be updated. For a more recent listing of files, head back to ShogoMAD and check out the files section links on the left sidebar! TNL would like to thank everyone in the Shogo community for their support and taking time out to send in updates and news over the last 4 years (omg, 4 years!). In the future, help support Shogo and keep it alive by showing your support for ShogoMAD.com! First I'd like to point out that TNL is seeing its first update in over 2 years! With the current failing situations at GameSpy and now on IRC, TNL has moved again to it's new and final resting place, ShogoMAD.com! ShogoMAD will be the new community meeting place with constant updates from the community; not by a corporation that thinks this game isn't worth the time because the ad revenue is down..
Next we have the latest anti-cheat files written by Apocalypse_DFA! These are the files you'll need to play on just about any shogo server out there these days. It protects against the widely popular rapidfire and skinny rez cheats that have plagued this game for years. For those of you who havent picked up this dandy file to help relieve some of the typical "Shogo lag", here it is. Just unzip to your main Shogo directory and the file will automatically load everytime you play =]. Looks like i82 has been a bit busy, as he has cranked out yet another sweet level. This is a larger size OF level, with something for just about everyone in it. As I took a stroll thru it i found a nice sized open room with a suspended bridge (below-left), an outside area complete with the painful green-goo (below-right), and of course the inside maze-like area. This level would be a good bet for 4-8 people, as weapons and power-ups are pretty abundant in this large level. Be sure to at least check this one out even if it's just on your own, cause this is one hell of a cool level =]. Interstate 82 has once again succeeded in dazzling us with another retail-quality level. This one is yet another addition to his 'Maniac' series, and in tradition has kept the quality of the level extremely high with his excellent lighting usage and layout design. I took a quick spin to see how an OF deathmatch would fair, and i must say it looks to be a damn nice level for about 2-6 people. An excellent compromise between a madskillz style level and a larger, more strategic level. Maniac Tower is a sure shot for any server runnin custom maps, and should be pretty sweet for some nice 1on1's as well =]. The screenies below are as alwayz for your viewing pleasure, so take a look and nab the map, its a nice and quick dl weighing in at only 175kb zipped, and u wont be disappointed =]. Here's another new board to feast your eyes on, a nice small to medium sized OF level. Inspired by Quake 3, Niall added the infamous 'jumpers' to this level, which is the first Shogo map I've encountered that uses this technique. Not quite exactly the same as the catapulting Q3 version, but none the less cool. A bit tricky to master since it only pops you up just high enough to get to the floor above, but once u get the hang of it it's not a problem. Anyway, take a gander at the screenshots and decide for yourself =]. Just got word from Sho that he (and his soon to be team) is picking up the LOF project (abandoned commercial MOD). He's just gotten underway, and is lookin for a few helping hands with the game programming. His current focus is on object.lto coding, so if you're familiar with this or other aspects of the Shogo code and wanna be a part of it all, drop either Sho or myself a line. With time and effort, this will prove to be one hell of a MOD release =]. Can you handle it? Another level by the maniac himself, i82. This one is a redone version of the first board from the single player mod 'The Maniac Challenge', now revamped for some multiplayer OF mayham. 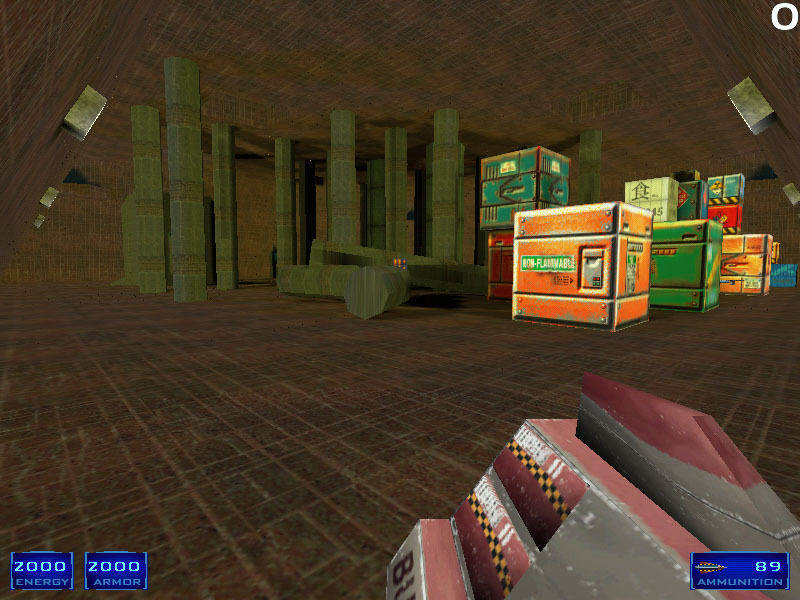 With new sounds, graphics, and lighting effects, this level stands out in a category of its own for DM maps: Kickass. Take a look at the screenies below and be sure to grab this level before you wander off into the great unknown.. I have so much learned at my first Map (MCA_THE_PYRAMID). You are in a dessert lanscape, the core of the Map is a Pyramid with five floors. The Pyramid is more detailed and bigger as in my first Map so you can better get around. And there is NO RR in this Map! Try it and if you like or hate it, please give me some feedback. Copyright ©1999-2002 demonrage - All rights reserved. Reproduction or reprint of material contained here without prior consent is prohibited.